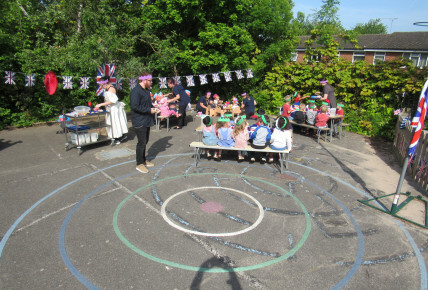 They decorated crowns, made wedding cupcakes out of playdough and painted Union Jack flags. Toddler room used their role playing area to enact a wedding while baby room looked through photos of the Royal Family working on their communication and language. Pre-School room made a very special 3 Tier Cake out of plaster and special jewels. This is proudly on display in the nursery corridor along with the castle. Does this look like Windsor Castle? 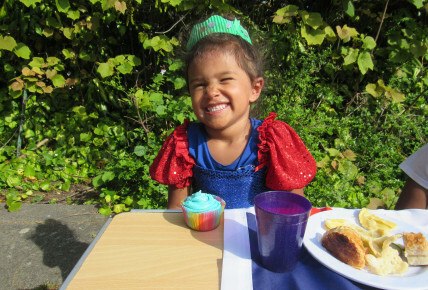 On Friday the whole nursery came together for a garden tea party out in the gardens. Baby room wore their specially made crowns along to the event and all enjoyed a very social tea of sandwiches, sausage rolls, vol-au-vents, crisps and our on-site chef Tracy even made replica cupcakes, decorated with red, white and blue frosting that had the same flavourings of the Royal Wedding Cake itself, Lemon and Elderflower! After tea we had 2 very special guests pop by for a royal wave!